Do your vegetable dishes need some inspiration? This cauliflower creation is your answer. It is a wonderful gluten-free side dish or it could serve as a hearty vegetarian main. It will soon be your family favorite because of the flavor. You will love it, because it is easy to prep. Toss the chopped cauliflower with 1 tablespoon Massel Concentrated Liquid Stock and 1 tablespoon olive oil. Place on baking sheet and roast for 20 minutes. In a small bowl combine 1 teaspoon Massel All Purpose Bouillon & Seasoning Granules and 1 teaspoon each of olive oil, panko breadcrumbs, cheese and rosemary. Set aside. Remove the cauliflower from the oven and toss white beans, red pepper flakes and lemon zest. Once the roasted cauliflower is well tossed, top with the panko mixture. 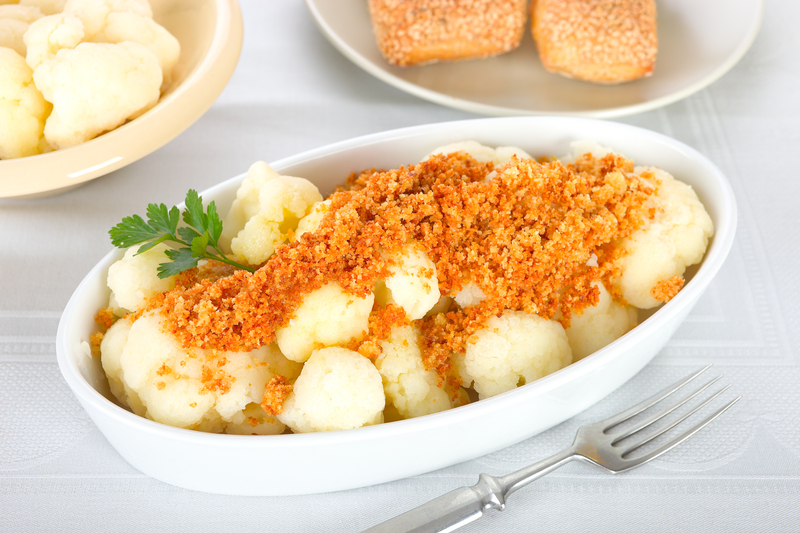 Place the cauliflower back in the oven for 5 minutes, or until breadcrumbs turn golden brown. You can substitute the cauliflower for broccoli and the white beans with chickpeas. It's a whole new dish with lots of great flavor! Want to get in touch or can't find our products?